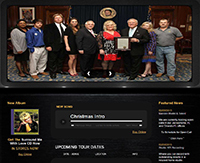 " Welcome To Our Jacksonville Vocal Lessons Website "
The gallery has many photos of our past and present vocal lessons. Be sure and visit our vocal tips and advice page for recommendations. Review our testimonials and see what Vicki's students have to say. Behind every great singer is a great teacher. Book your lesson today. From a vocal demo, to a fully produced and mastered CD, we give your song, lyrics and or poem the quality sound you need and want. Be sure and check out Vicki Lee's Website!!! Vicki has appeared on several television shows including the Ralph Emory Show in 1984. She has performed at various rallies in the State of Georgia during Governer Jimmy Carters campaign for presidency. This lady has achieved moderate success in the country music circut. 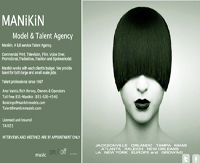 Manikin, A full service Talent Agency. Commercial Print, Television, Film, Voice Over, Promotional, Tradeshow, Fashion and Spokesmodel. Vocal Lessons, voice lessons, singing lessons, vocal coaching, vocal instruction, whatever way you want to define it, you have found the person who can help you! Let Vicki Lee bring your voice to life. Are you serious about your singing? Are you ready to be a star? Do you want to know more about the music business? If so, then let’s get to work. If you are searching for powerful, effective vocal training you have come to the right place! 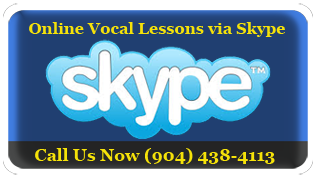 We offer both private and group lessons in our Jacksonville Vocal Studio or online via Skype. You will improve Breath Control, Stamina, Power, Range, Pitch & Versatility! 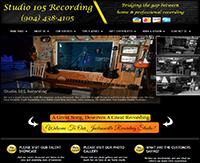 Vicki Lee with Studio 105 Recording has been offering Jacksonville Vocal Lessons since 2004. Vicki creates a customized vocal lesson for each student by assessing their technical strengths and weaknesses in order to create an atmosphere tailored to each student's learning style. Vicki Lee will show you how to bring music alive one note at a time! 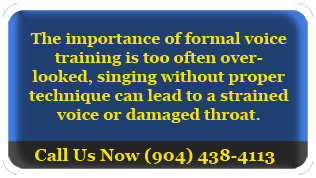 Our Vocal Studio offers professional voice lessons in Jacksonville Florida. Vicki Lee specializes in vocal training using special techniques of vocal development. Our Vocal instruction techniques help improve your range, endurance, stamina, breath-control, resonance, vocal strength and vocal quality. Learning to to sing properly will allow singers of all styles of music to perform without fatigue or damage to the voice. Learn to sing like the pros while training in our studio or your own home and when it is convenient for you. Yes, you really can learn to sing Vicki's vocal lessons. So, if you have been wanting to find success in singing, now is the time. You have nothing to lose so don't delay!!! Whether a student comes to Vicki to increase their vocal range in a single lesson or work with her for several years to develop to their full potential, she provides them with the tools they need to continue learning on their own. Often, students start out with weekly lessons and return only when having difficulty or need to prepare for an event such as recording an album or touring. If you are not located near Jacksonville Florida, then our online Skype vocal lessons is a great opportunity for you to reach your goals as a singer and artist without the expense of traveling! Contact us now to get started today. Behind every great singer is a great teacher. Book your vocal Lesson today. If you want to record your lesson or just have a recording of your performance to take home, simply let us know in advace and Vicki can record you directly through the system. ( In-House Studio Only ) Additional fees apply. You'll have a CD quality recording which you can then listen to on your CD player or computer. More and more people are purchasing voice lessons with Vicki as the perfect gift for the singer in their life! If you're looking for a unique Christmas, Birthday or Anniversary gift, why not book a consultation with one Florida's premier vocal coaches? It could be just the confidence boost any singer needs. Vicki offers Singing lesson gift certificates. Each certificate can be redeemed for a complete 60 minute voice lesson in either your home, our studio or via online Skype. Book a singing vocal lesson now and give someone a gift they'll never forget. If you just want to be the best singer you can be, Vicki will give you the tools you need to be a confident, multi-skilled and successful singer! All vocal lessons are personalized to ensure you get exactly what you need and want to achieve your goals, in as short a time as possible. If you're unsure about your voice and you just want a professional opinion of your abilities, Vicki will be happy to arrange a consultation where you can discuss your needs and she can help point you in the right directon. 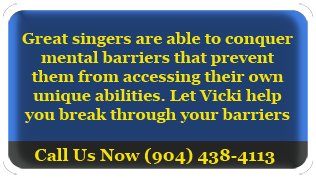 Vicki offers vocal coaching and singing lessons via Skype for clients who cannot attend her studio in Jacksonville Florida. If you're not based in Jacksonville Florida or unable to travel, Modern technology means that there's no need for you to miss out on a one-to-one session with Vicki! Skype lessons can be booked in blocks of 60 minutes. All Skype lessons must be paid for in advance. We offer both one-on-one instruction and group lessons. Lesson lengths are 1 hour.
" Jacksonville Florida Vocal Lessons "